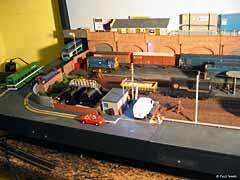 small layouts. This month, I ‘m adding a seventh Topic: Lighting the Layout. All too often, a well planned, well-modeled layout is displayed by just placing it on a table and hooking up the powerpack. And the meticulous models and scenery are hard to see because the room light is too dim (or too bright) or is shining in the wrong places to show off the layout. 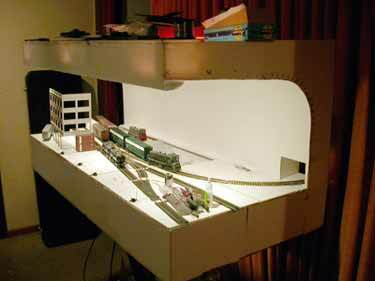 I believe it’s worth the trouble to build your own lighting rig for a small layout — even if it’s only a desklamp placed in the right position. The right light can make our modeling efforts much more effective with the audience. When I first exhibited Peek’s Pike at a clinic in Pittsburgh, I unpacked it from its box right in front of the crowd, carefully hooking up the backdrop and other scenery. Everyone watched intently as I placed a locomotive and some cars on the track. Then I switched on a carefully positioned Ott desk lamp — a daylight-corrected fluorescent light source. Suddenly all the colors and shapes in the layout snapped into brightness … and the audience actually gasped. For the first time, they saw the layout the way I had planned and built it. The lighting made a huge difference! 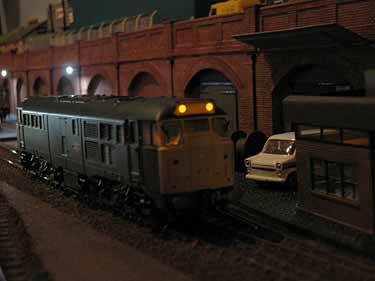 These two photos by Prof Klyzlr (above and below), taken on one of his layout modules, illustrate the need for consistent light levels across the layout. The top photo shows the view using only two lights, at the extreme left and right of the picture. Then, shot from exactly the same spot, the photo below shows what happens when a third light is introduced in the middle. Suddenly, the layout comes alive — and most important, the locomotive can be clearly seen and appreciated! 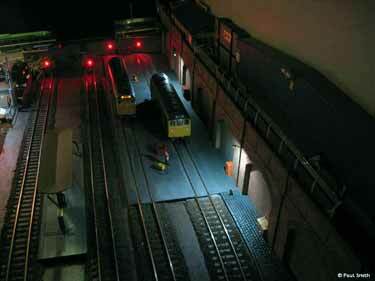 These two photos were taken under the halogen bulb lighting on the Prof’s 48x14in Nine Mile layout. The digital camera settings were not changed between shots, but the change in lighting even forced the camera’s auto white balance to re-adjust! The Prof comments, “12V AC halogens in gimble mounts have now become my favorite solution, especially as they are available at much cheaper cost… Here are two hints for using them. As a further illustration of his point, Prof K sent along two views (below) of his new layout under construction, Brooklyn: 3 AM. These two shots show the even lighting obtained from three 20 watt halogen gimble-mounted lights on a six-foot-long layout with a white, coved backdrop. You can see the lights’ positions glowing on the valence (which will be covered with opaque material when the layout is finished). 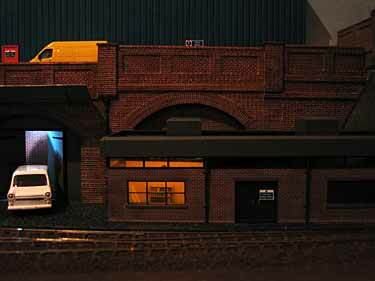 In England Paul Smith has also been experimenting with “night lighting” on his exhibition layout, Widnes Road. 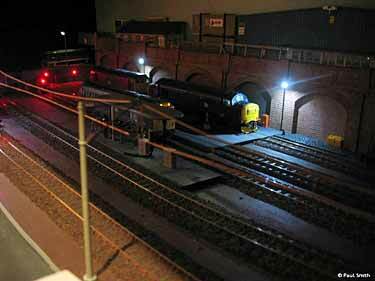 The layout is a finescale DCC 4mm terminus, with trains entering beneath the overbridge at the right, and ending at the buffers (bumpers) at the left end. The entire visible portion is only 4ft 6in long with a 3-road hidden traverser (transfer table) at the right end bringing the total length to about seven feet. The photos below give an idea of how the layout looks. 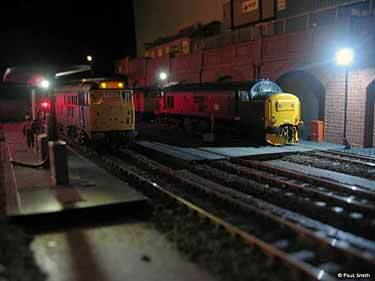 Then came “The Bet” — Paul wagered with some fellow Club members that he could turn this “five roads on a plank with two turnouts and a traverser” into a proper display layout by the Club’s Exhibition date, just a few weeks ahead. His wife suggested the winning strategy — build a night scene, so the scenery needn’t be very detailed! As Paul tells it, “My wife is an artist and visual arts teacher at a high school, and she designs and paints stage sets for the kids. She came up with the perfect solution, and my friend Dave and I spend a hurried Friday night before the exhibition constructing the wooden frame, whilst Alice got to work with the sewing machine! I have to confess I am now so pleased with the result (at right) that I am glad it ended up the way it did. The photos below show some of the results of Paul’s experiments. More shots can be seen at his photo album online. 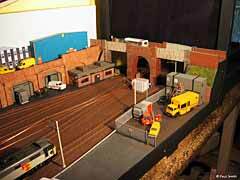 I think these two examples, from Professor Klyzlr and Paul Smith, show how effectively lighting can be used on a small layout, to make its impact more dramatic and to show off our models at their best. I’d like to hear your experiences with layout lighting and your ideas and photos about ways to use it. Just click the “contributions” button at the bottom of the page to get in touch! 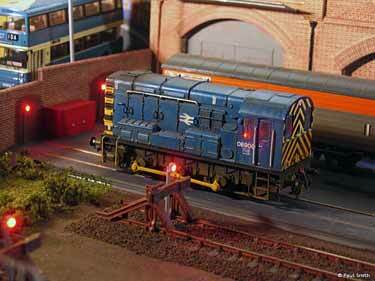 and here are a few more to whet your appetite for this excitng branch of the hobby. 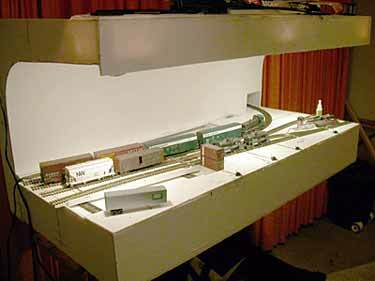 Layouts shown here cover all the major scales, from G to N.
G-SCALE TRACTION ON A BOOKSHELF! A friend of mine wanted a simple bookshelf layout to run his 4-wheeled G-scale Bachmann trolley. He suggested a variation on Bob Hughes’s space-saving design of Green End Quarry. I came up with this design, which replaces Bob’s backscene with a two-sided view-block building. The line runs from city to country and back again. None of the city buildings is a complete structure, they’re all cut off by the boundaries of the layout — allowing us to have large G-scale buildings in a very small area. The country end can be landscaped as an end-of-the-line waiting shelter, the entrance to Electric Park, or whatever else you like. N TROLLEY/TRAM LINE IN HALF A SQUARE FOOT! 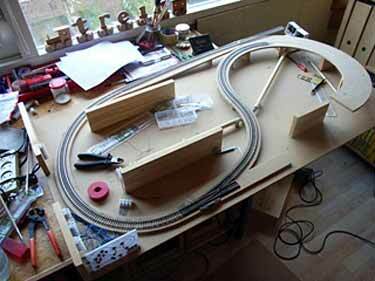 Nick Kibre, from California USA, designed this tiny N-scale oval trolley (tram) layout to fit inside a small end table. Measuring only 8x9in (20x23cm) overall, the line covers just half a square foot in area! 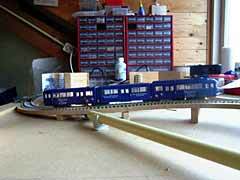 Nick is building two N-scale four-wheel trolleys to run on the layout. 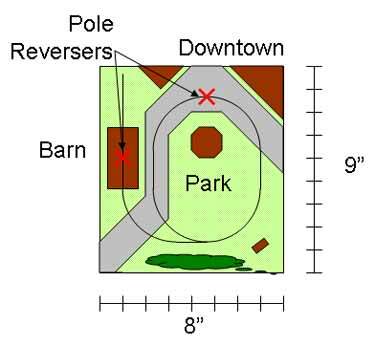 They both will have working trolley poles that can reverse direction automatically at the two positions shown (marked with an “X”), thus providing a form of point-to-point running as well as round-and-round. 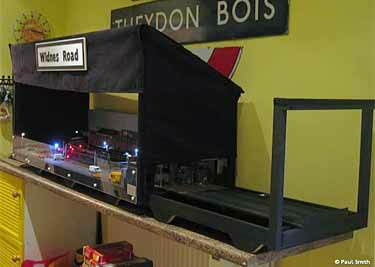 For more details as well as information on some of Nick’s other N-scale traction projects, see his trolley blog. 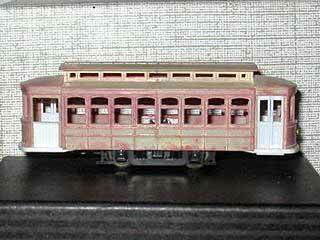 The two trolleys Nick is building are based on plastic car bodies from Bachmann (left) and Model Power. He’s converted both to one-man cars with one door on each side by blocking the rear doors on the original bodies. Paint and body putty will conceal the surgery. 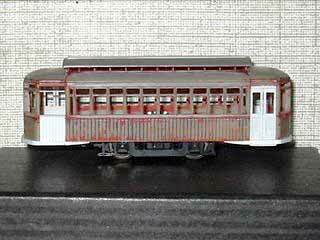 DeBrie et Cie. is a European style industrial tramway under construction by Richard Heisler, from Eureka, California USA. 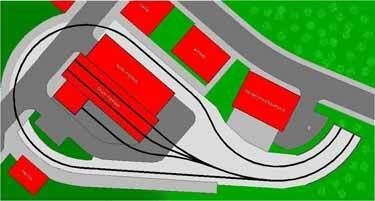 Track plan is a basic Inglenook and the scale is 1n20 (1:32 scale running on 16.5mm gauge). 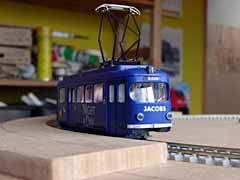 Richard scratchbuilt the little industrial lokey on a Bachmann On30 trolley mechanism. The layout measures 42x12in (105x30cm). Scenery is almost entirely made from computer-printed paper, using textures from the Internet. 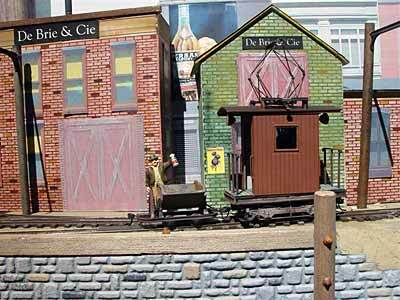 Richard was influenced by my Footers Dye Works layout, so DeBrie et Cie. is a dye maker, thus providing the Bachmann skips with bright colored loads to differentiate one from the other when solving Inglenook shunting problems. 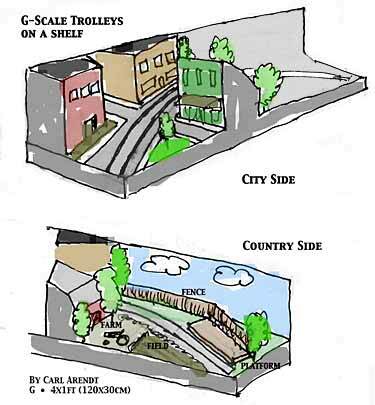 Martin Van Horn, of Towson, Maryland USA, sent an update on his Houksville and Fowblesburg traction empire, which consists of three small, interconnected On30 trolley lines (see plan above right). 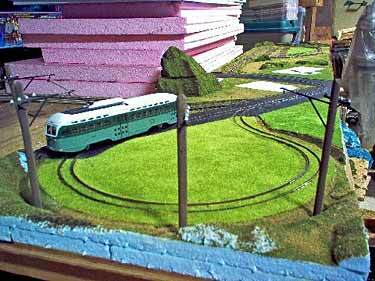 The line at the left side of the plan, a version of the Hidden Valley Traction layout from this site, was reported in Scrapbook #54a. Martin sent the updating picture at the upper left, which shows the first four trolley poles installed on the Electric Park loop of this line (not shown is the electric wiring underneath the baseboard, which connects everything together). The line shown at the right of the plan is a square layout Martin built in the 1960s in HO, on a 30in (75cm) square table. It will be 45in (114cm) square in On30. For more info, see Martin’s web pages at On30Center.com. 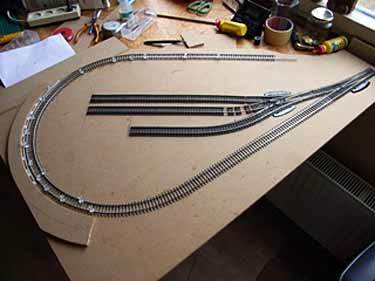 Marc de Bruin, from Barendrecht in The Netherlands, is building this compact transit line in HO scale on a 70x131cm (28x52in) baseboard. The two-level design provides a hidden source of continuous traffic on the lower level (including a cassette siding for adding trains to the mix) and a passenger destination platform at the upper level, along with a planned car barn (two-track car shed). 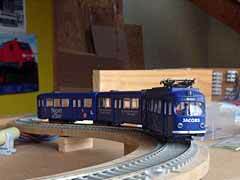 The scene represents a tram terminus somewhere in Germany. Marc has just begun building this little line, inspired by this site. The photos below show the current state of the layout. You can watch progress at his website.